What is the key to understanding Bible prophecy? August Rosado: I would have to say the biggest key is the literal interpretation of God's Word. Even though the book of Revelation uses a lot of symbolism, we need to look for a literal interpretation behind the symbolism. The reason why we get into so much doctrinal trouble today is because we take the symbolism and we interpret it with more symbolism. This is where we get into trouble. We need to take Gods' Word for its plain sense, literal meaning. As you say, "If the plain sense makes sense, don't look for any other sense, or you will end up with nonsense." Dr. Reagan: I think that is certainly the number one rule for the whole Bible from beginning to end. Don't spiritualize it. Take it for its plain sense meaning. Surely there are symbols, but even symbols have plain sense meanings behind them. Take it for its plain sense meaning. One of my favorite quotes about Bible prophecy comes from Dr. Henry Morris who founded the Institute for Creation Research. In his book The Revelation Record which is his commentary on the book of Revelation he says to the effect, "I am writing this book because people tell me they can't understand the book of Revelation. It is just too difficult to understand. I've got news for you. It is not difficult to understand, it is difficult to believe. If you'll believe it you will understand it." One time I looked through all of the commentaries I could find on the book of Revelation. Many for example said that in Revelation 7 where it says there is going to be 144,000 Jews in the end times that are going to be given special responsibility, 85% said that this passage was talking about the Church. What does God have to do to convince us He is talking about 144,000 Jews? After all, He names them by tribes. But, we spiritualize these things to death. People love to do that because then they become God and because they can make the Bible mean anything that they want it to mean. August Rosado: Exactly! Frankly, I believe allegorizing Scriptures is blasphemy, because you are making yourself God and you can come up with any form of interpretation that you want. Dr. Reagan: I would say to really understand Bible prophecy you've got to have the indwelling of the Holy Spirit, because the Spirit is going to help you to understand. You do not have to have a Ph.D. in hermeneutics. You do not have to have a vivid imagination. But, you do have to have childlike faith. If you approach the Bible with childlike faith and rely on the Holy Spirit, you can understand the Bible. August Rosado: Before I got saved I tried reading the Bible and it was like Chinese to me. I could not understand one iota of that book. But, after I got saved almost 23 years ago, the Holy Spirit opened my eyes. 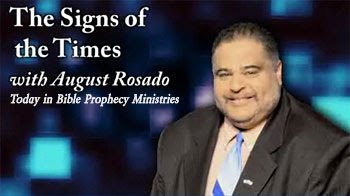 In the next part of our interview with August Rosado, we'll ask him to share his personal testimony. Its odd how ‘they’ interpret all other Scripture literally taking into account context, grammar and history – then switch to allegory for prophecy? Recently I read that ‘Bible prophecy is history written in advance’ – just as sure, and as certain as when Bible prophecy is fulfilled – literally. From past experience, I thought I would add that to interpret God’s Word ‘literally or normally’ (just as we would a legal document) is not the same as ‘letterism’ which is ridiculous. Allegory is a literary device, used in God’s Word as an aid to understanding and emphasise. E.g. God is not literally in the form of a mother hen with feathers, wings and clucks; it is picture language to convey how much God loves and protects His people, which is its literal meaning – unchanged. I'm sure August would love to come over to Merry Ole England and share some good literal interpretation of the Bible, Sue! Why, I'd try to hitch a ride with him, though I'm wary of all the 1984-type cameras. Why you wary Nathan? I havent broken one yet - and a handsome lad like you - no Worries!